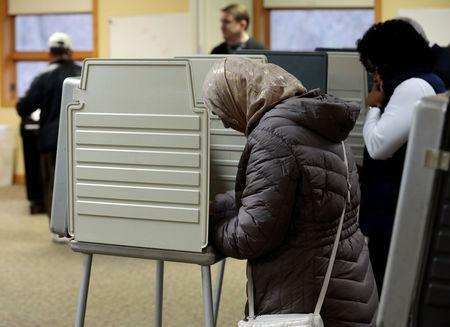 WASHINGTON (Reuters) - Polls closed in more than half of the 50 U.S. states on Tuesday after a divisive election campaign that will shape the future of Donald Trump's presidency, and most of the key races that will decide control of the U.S. Congress were still too close to call. Democrats struck first in the battle for the U.S. House of Representatives, ousting incumbent Republican Barbara Comstock in a suburban Virginia district outside Washington to pick up the first of the 23 seats they need to gain a House majority, according to data provider DDHQ and U.S. media outlets. Democratic Senators Bernie Sanders of Vermont, a 2016 presidential contender, and Tim Kaine of Virginia, Hillary Clinton's vice presidential nominee in 2016, easily won re-election, news networks projected. Democratic Senator Sherrod Brown was projected to hold his seat in Ohio. Republican Mike Braun opened an early lead in the crucial Senate showdown in Indiana with incumbent Democrat Joe Donnelly, but the race was too close to call with just 20 percent of the votes in. Tightly contested Senate races in Florida and West Virginia also were too close to call, as were high-profile races for governor in Ohio and Georgia. A full picture of the voting results will not emerge for hours, with many of the most important races considered toss-ups heading into Election Day. The first national elections since Trump captured the White House in a 2016 upset became a referendum on the polarizing president, and a test of whether Democrats can turn the energy of the liberal anti-Trump resistance into victories at the ballot box. The Democrats are favoured by election forecasters to pick up the 23 seats they need to gain a majority in the House, but opinion polls show they have slimmer hopes of picking up the two seats they need to gain control of the Senate. All 435 seats in the House, 35 seats in the 100-member Senate and 36 of the 50 state governorships were up for grabs. 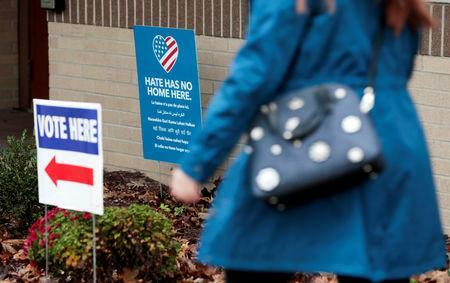 The volatile midterm campaign was marked by clashes over race, immigration and trade. In the final stretch, Trump hardened his rhetoric on issues that appealed to his conservative core supporters, issuing warnings about a caravan of Latin American migrants headed to the border with Mexico and condemnations of what he called U.S. liberal "mobs." Many Democrats, already benefiting from anti-Trump enthusiasm, focused on bread-and-butter issues like maintaining health insurance protections for people with pre-existing medical conditions and safeguarding the Social Security retirement and Medicare healthcare programs for senior citizens. If Democrats capture the House, they could block Trump's policy agenda and launch congressional investigations into Trump's administration, including his tax returns, possible business conflicts of interest and the nature of his 2016 campaign's ties to Russia. A Republican victory in both chambers of Congress would be a validation for Trump's polarizing style, a month after he solidified a conservative majority on the Supreme Court when the Senate confirmed his nominee Brett Kavanaugh after a fight over sexual misconduct accusations against the jurist. Striking a dark tone at a rally in Indiana on Monday evening, Trump accused Democrats without offering any evidence of "openly encouraging millions of illegal aliens to break our laws, violate our borders and overrun our country." Ahead of the results, U.S. stocks closed higher, with the benchmark S&P 500 Index <.SPX> ending the day at a two-week high. U.S. Treasury securities prices fell, and the 10-year yield closed at its highest level since 2011. The dollar was unchanged. Problems with voting machines prevented Americans from casting ballots in a dozen states, U.S. rights advocates said, following complaints about registration problems, faulty equipment and intimidation they have received throughout early balloting. 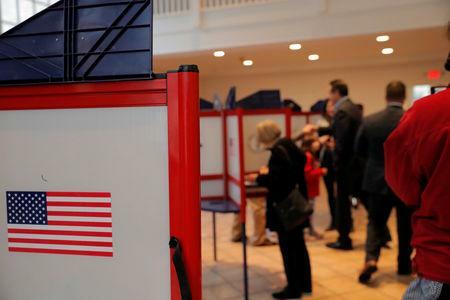 But a U.S. Department of Homeland Security official said the reports of voting technology failures appeared so far to have had no significant impact in preventing people from voting. Voter turnout, normally lower when the presidency is not at stake, could be the highest for a midterm election in 50 years, experts predicted. About 40 million early votes were likely cast, said Michael McDonald, a professor at the University of Florida who tracks the figures. In the last such congressional elections in 2014, there were 27.5 million early votes. "I have worked at this poll the last three elections and this is the biggest turnout ever," said Bev Heidgerken, 67, a volunteer at a polling place in Davenport, Iowa. At least 64 House races remain competitive, according to a Reuters analysis of the three top non-partisan forecasters, and Senate control was expected to come down to a half dozen close contests in Arizona, Nevada, Missouri, North Dakota, Indiana and Florida. In his time in office, Trump has pushed tax cuts through Congress and overseen a period of economic and jobs growth but has failed so far to deliver on presidential campaign promises to replace the Obamacare healthcare law and build a wall on the Mexican border that he has said is needed to combat illegal immigration. A Democratic victory in the House would further hinder the border wall plan and complicate congressional approval of a deal to update the North American Free Trade Agreement. Trump also could face more pushback from Democrats on trade tariffs he has introduced, particularly in farm states hard hit by retaliatory measures from China or manufacturing states hit by higher steel and aluminium prices. A debate about whether Trump's inflammatory rhetoric encouraged extremists erupted in the campaign's final weeks after pipe bombs were mailed to his top political rivals allegedly by a Trump supporter who was arrested and charged, and 11 people were killed in a shooting at a Pittsburgh synagogue. Democratic former Vice President Joe Biden called on Americans to use their votes to reject Trump. "This is the single most important off-year election of my lifetime. I really think it's more than just about a specific issue. I think it's about the character of the country," he said in Wilmington, Delaware, where he voted. Democrats also could recapture governorships in several battleground states such as Michigan, Wisconsin and Ohio, a potential help for the party in those states in the 2020 presidential race. It was the first national election in the United States since the 2016 race in which Russia interfered, according to U.S. intelligence agencies, with a campaign of hacking and propaganda to sow discord, harm the Democratic presidential candidate and boost Trump's chances. Russia denies meddling.